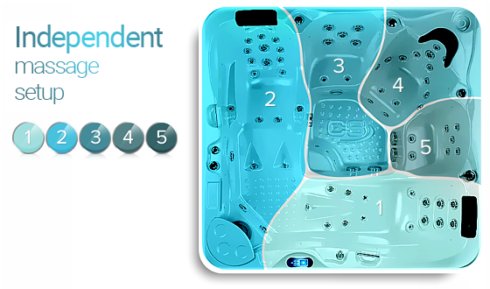 Independent massage setup and control in the whirlpool part. Every Canadian Spa whirlpool bathtub is equipped with a few of independent massage circles. Users can manage their own massage settings precisely adapted to their body. As for smaller models or shapes, particular massage circles are usually connected. By default, every larger model has independent functions of the swimming and the massage part. Each user can manage their own control panel. Some of more advanced product packets provide independent massages for each body area such as neck bone, or back massage.